A few weeks ago, I had decided that I was tired of all of the busy work that the teachers and school send home with the kids that end up causing more work for the parents (I am very busy these days and didn’t need the extra work). You know…like decorate this poster kid to look just like you (cutting yarn hair, digging out craft supplies, finding an old shirt to cut up and decorate with), send out this Flat Stanley (decorating the paper doll and begging a family member to do something cool with it and send it back for the class to look at), etc. The very next day after my complaining about this, Isabelle comes home with a paper about the Florida Tropicana Speech Contest that is NOT optional. My fourth grader had to write and give a speech! Ridiculous! Needless to say, I was not a happy camper. The good news for me was that Isabelle came home all pumped that her daddy does speeches every week so he was going to be good at helping her. And like a good daddy he did just that. Isabelle picked the topic of love. Will had recently preached a series of sermons on Love and Isabelle has been dealing a lot lately with kids picking on and being mean to each other at school. So this subject is near and dear to her this year. Will helped Isabelle to get an outline together and come up with an organized introduction paragraph. She researched by looking up definitions, listening to Will’s sermons online again, and looking up verses in the Bible that she wanted to use. She filled in the information and wrote the rest of the speech all by herself. Her daddy helped her read over it and make sense out of the few spots that didn’t sound right. She worked very hard and after giving the speech she won third place in her class. The top three from each of the fourth, fifth, and sixth grade classes then had to give their speeches in the auditorium for judges, those grade level students and teachers, and the parents of all of the speakers. Isabelle did very well. She was nervous and very quiet, but she tried her best. Even though she didn’t place in this part of the competition, I am very proud of her! I probably would have cried every night and begged my mom not to make me do it. Here is the video of her giving her speech this morning. It is very quiet and you will have to turn your sound up all the way and make sure there is no noise in the room to be able to hear her. Also, Luke is whispering the whole time and making noises, so you will hear that during the video as well. 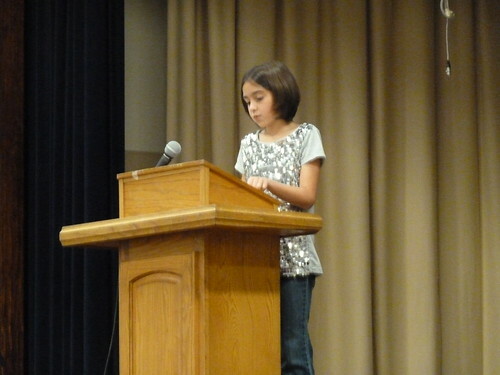 For those of you that don’t want to listen to the video, here is photo of Isabelle during the speech.